Lately I've been bored with our dinners. Maybe because it seems that we've been so busy that we always need super quick meals and maybe I'm bored of our usual quick meals? 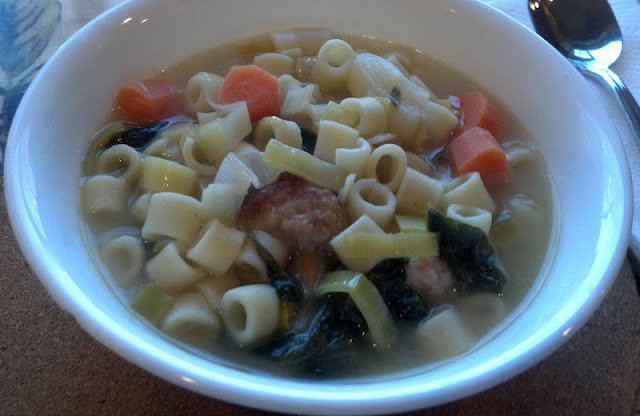 When the current issue of Bon Appetit arrived, I saw this recipe: Spring Minestrone with Chicken Meatballs. SP loves soup. I like pasta. I like little meatballs in soup. It seemed easy and supposedly took only 45 minutes to make. So we decided to make it. The first step was to make these mini chicken meatballs. The house smelled so good as they browned in the skillet. On a side note, our chives have woken up from winter and are thriving on our deck. I never expected any of our herbs to start growing again. I figured this spring we would be digging out the dead, brown herb twigs and planting newly purchased herbs. We were able to use fresh chives in our chicken meatballs thanks to the recovered chives. After the meatballs, it is simply a matter of sauteing the leeks and then adding the other ingredients. It makes 4 servings, and we'll probably get 4-6 servings, so that's 3 dinners. We usually eat crackers or bread with our soup. I love the meatballs - they taste amazing. The soup is quite tasty, too, but for me, there are too many leeks. SP loves leeks so he's happy. I've been picking out the leeks and giving them to him! Definitely a good addition to the quick & easy meal list.